wait for goty with all.the dlc and to launch on pc . i am pretty sure she will be a weapon or a sacrifice machiam "I am Setsuna" style. so the story is going to be very moody and tragic type like FFX. i really hope they can pull this off. maybe you can edit and link the youtube episodes for the rest to watch. they really pushing a lot of side media for this one. got a full CGI movie, anime series, and retro game. yup. i also didn't bother. but hor, all these side media got no spoilers but build up to the whole story. so if you are into it, better to catch up with the lore. 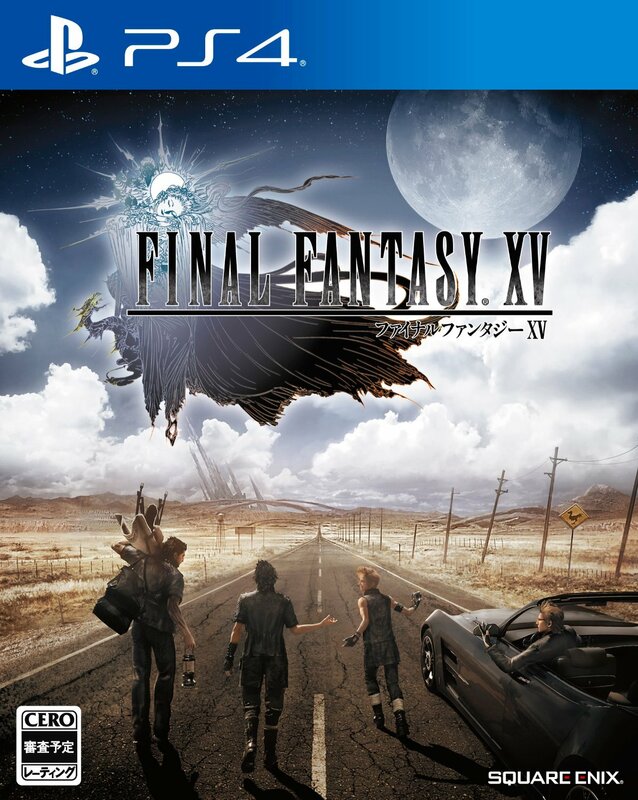 Final Fantasy XV is the 15th installment of the Final Fantasy franchise, releasing September 30 2016 worldwide for PS4 and Xbox One. Originally known as Versus XIII, the game has since shed many of its roots and should for all intents and purposes be considered a new game. It features ARPG gameplay, an expansive and traditional FF style of open-world and a 50+ hr main story. All Final Fantasy games feature separate stories and characters, with only some recurring elements between each. It's perfectly okay to start with FFXV. 1. Reclaiming Lucis from the invading nation of Niflheim. 2. Noctis' journey to become a worthy king and his search for Luna. 3. The slow decline of the world as the nights become longer and the days become shorter. FFXV features an action-RPG system with an emphasis on weapon-switching, strategic defense and warping mobility. Fights occur on the field and in real-time. Only Noctis is directly controllable, though the party of four can be controlled in other ways. Classes : Swords , Spears ,Daggers , Firearms , Royal Arms , Shields , Elemental Spells and Machines. works completely differently.each weapon has a specific trait, say you have two sword swords. so one shortsword might be aerial, as in, it would allow you to combo in air and evade at the cost of mp.but on the other hand, it may do low damage on ground and may have only 1 ground combo.the second one may give you better stun and more ground combos but no aerial attacks. a katana may let you fast warping slashes while the other may let you do crits in one hit .you can forge and synthesise weapons to make new ones.your allies seem to have a fixed set of jobs they can switch b/w as well. Active and Passive. Each weapon comes with a set of both.passives can be like low mp cost in air/drain magic per hit etc For actives,It seems like theyve been removed from triangle and added into the weapons combo moveset. like double flick back on the l stick plus circle now lets you use tempest instead of selecting it and pressing triangle.which leads me to believe every single weapon will come with its own combo tree based on what traits, active and passive abilities it possesses.combos and special attacks can be executed by pressing circle with various directional inputs and timings. Elemental and Ring. Elemental magic is used by manually aiming and equipping in a weapon slot. These are pure elemental releases that affect you as much as they affect the enemy . they also react naturally to weather conditions and the environment .eg a blizzard causes an actual blizzard leaving frost trails on you and the enemy, slowing down your metabolism to slow down your attacks and actions.but during rain or in a puddle, its effects are amplified and its likely to freeze the enemy completely.you apparently draw these from the environment or from fallen enemies.these can be synthesized to make stronger ra,ga versions or different spells.this type is exclusive to noctis. the second, ring magic is obtained later on in the story and can be used by anyone drawing mana from noctis.theres a good chance this has its own menu,not being present in the weapon screen and is assigned to a button. we dont yet know what spell come under this type but its safe to assume, buffs/debuffs/healing and non elemental spells like gravity etc come under this. the b tier, lets say ifrit and the like should be mid sized summons that fight alongside you for some time, and this is pure speculation. the a tier summons seem to be huge gods that only appear in their own specific region, due to their size they cannot follow you around.they will usually only use 1 attack when summoned but it differs based on the situation.you CAN summon them indoors but we dont know what exactly happens then. AI is governable with a gambit like system.they can be levelled up freely just like noct.have multiple jobs.you can use special team attacks(similar to chrono trigger) based on proximity and friendship levels.you can also directly use their ablities mid fight from a shortcut menu.the camera centres behind them for the duration. Active armiger and armiger skills. devil trigger like mode that powers you up and gives you new special attacks based on the phantom swords you have equipped.has more than one form, yet to be revealed.armiger skills, work outside of armiger mode and give special skills like projectile deflection and knightsguard. these are special attack qte's counters.they require you to learn the weapon type a particular enemy is weak to and have it equipped before you before you initiate the parry. a prompt and visual cues are given to notify if an attack can be countered . holding defense initiates the process. they are similar to kh2's reaction commands in execution, as in , they always only need the same button to be used so theres no guess work and reaction. they are also alway not pure melee or even pure damage based. they can be long combos requiring multiple presses and depending on your friendship levels , your partners may join to attack using special attacks. for eg, if noctis fights and counters the iron giant alone, he blocks the giant's blows and then sets him on fire. but if the e3 2013 trailer is to be believed , having galdio and prompto join in extends the attack such that the giant gets stunned through prompto's bullets , noctis counters, gladio takes the giants sword to stab him then noctis uses a stronger fire than 1hko's him. also, royal arms include misc weapons like shurikens, and we havent exactly heard what machines do at all.could be mechs , could be similar to the engine blade or something. shields also, arent just regular shields, they can attack and stun any enemy with a timed block.in fireams, so far weve seen a pistol and something that looks like a rocket launcher.youll also allowed to manually aim firearms like any shooting game. 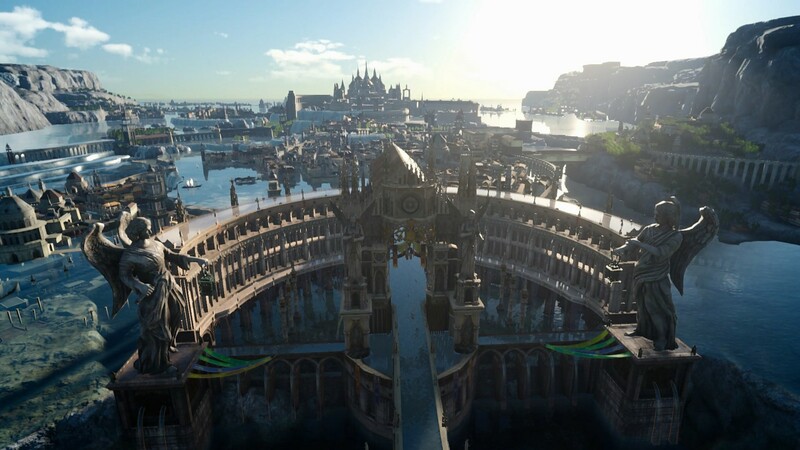 FFXV has an expansive world that strives to encapsulate its key phrase "a fantasy based on reality." 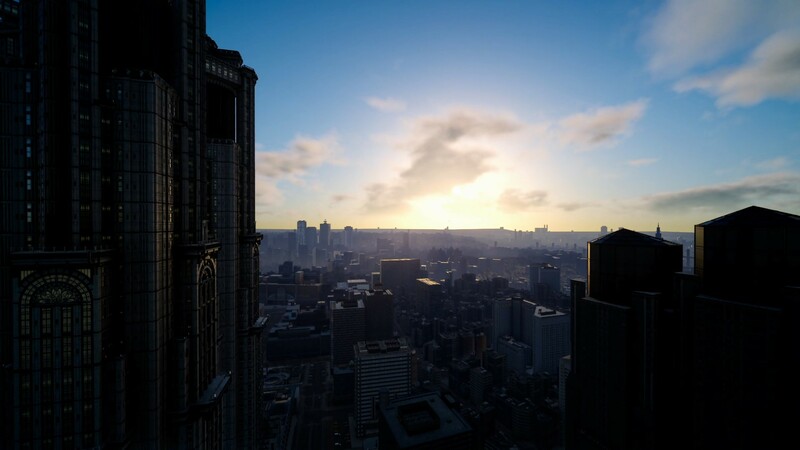 Its vistas are rooted in real-world locations, but given a fantastical touch. 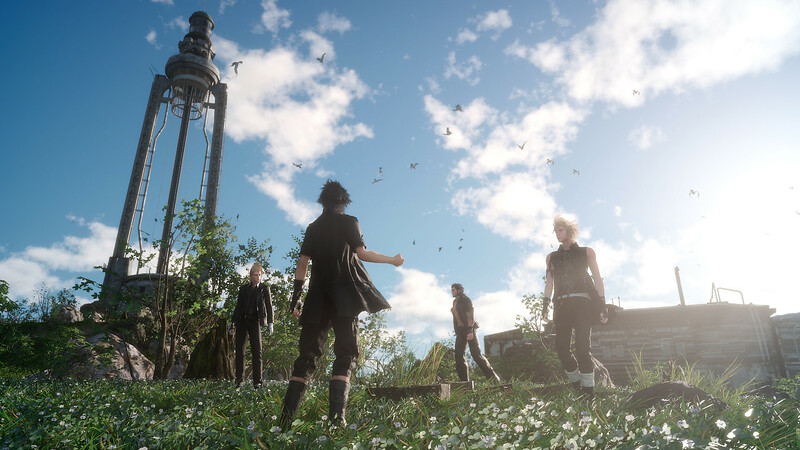 Unlike other open-world games, FFXV aims to focus on story primarily before creating side-quests. However, it does feature an extensive list of distractions, including NPC quests, mini-games such as fishing and pinball and optional dungeons to explore. Noctis is joined by his three party members Ignis, the strategist, Gladiolus, the muscle, and Prompto, the troublemaker. Each share a strong sense of brotherhood since childhood, reflected in their interactions. FFXV's enemies are primarily divided into monsters and opposing armies. The monsters in the game are strongly influenced by Yoshitaka Amano's designs of more traditional Final Fantasy monsters with a focus on making them grounded and 'real'. The opposing army consists of android soldiers to flying dragoon to large mechs with a strong resemblance to Magitek armor from previous FFs. So what's this about a demo? There is a demo currently on the Playstation Store called Platinum Demo. The majority of this demo is more of a Tech Demo than gameplay, and only the boss battle is representative of the final game and its gameplay (in a severely restricted form). Another, older demo is known as Episode Duscae was available only to those who purchased Day One copies of Type-0. Although more representative in terms of exploration and party interaction, the combat has since changed quite drastically. What's Kingsglaive? Brotherhood? Justice Warrior Five? Kingsglaive is a movie set within the first chapter of the game, focusing on the struggle between King Regis of Lucis against the forces of Niflheim and Nyx, a royal bodyguard, attempting to get Luna to safety. Brotherhood is an anime focusing on the bonds of friendship between Noctis and his companions. The first episode has already been released on Youtube. Neither Kingsglaive nor Brotherhood are required to understand the story of FFXV, but are recommended adjuncts to gain a full appreciation of FFXV's tale. Justice Warrior Five is a companion app available in June on iOS and Android. It's a pinball-based minigame that will also be available on the main FFXV game. What weapons will Noctis be using? Noctis has been confirmed to be able to use swords, daggers, greatswords, firearms, lances, royal arms (such as a large shuriken), shields and more. Is there a levelling system? Yes. It's unknown exactly how it works at the moment, but the director has confirmed that you'll be able to choose what to specialise in, such as dodging better or improving party commands. Instead of being based on MP, magic is more like a weapon with limited charges. You collect charges like a resource from various places on a map. Each magic has an effect on the environment, with Fire causing a flame eruption that can burn grass and party members and Blizzard freezing the entire surroundings. Are those four the only ones in the party? Those four are the only confirmed main party members. However, guest party members will take a role in the game. In particular, Cor Leonis, the elderly bodyguard of King Regis has been confirmed to join the party as a guest at some point in the game. What kind of transportation will there be? Noctis and crew will travel around the world in their customisable car. You can manually control where you drive as well as stop and get out of the car whenever you want. They will also have boat trips, gondola rides and trains trips, although it's unknown how much control we'll be given with those forms of transport. 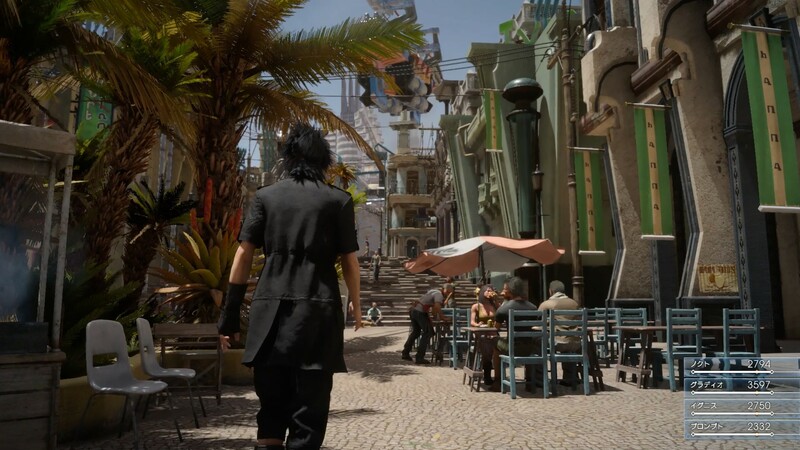 As pointed out above, FFXV has large towns that are explorable, with NPCs to interact with and other things to do, such as eating at restaurants, going fishing and touring around its sights. There are currently over 200 sidequests currently implemented in the game, with more coming in the final game. - Ravus will not be the main villain. He is some kind of Noctis' rival whose goal is to get revenge from the events alredy shown in Kingsglaive. He'll get murdered by Ardyn after a battle against Noctis and his friends. - There will be an entity which is similar to Eternal Darkness (Necron) from FFIX. It's the cause of the plague of the stars. That entity is a corrupted deity that watches Eos without acting. Aldercapt "awakens" it with the power of the crystal. - In one part of the game, Cor Leonis enters on the party replacing Noctis. We take control of an overpowered Cor. After Noctis regains coinciousness, Cor gets murdered in an unwinnable battle that the player will face. It's, to make a comparation, similar to General Leo's death. - The story (properly said) of the game doesn't start at FFXV. Neither at Kingsglaive. It starts six thousand years before Regis' death. It's a global story. - The weapons have nothing to do with FFVII's, They are ancient militar machines awakened by Niflheim that move with the power of magic. But there's not so much magic left in the world. - We'll battle Verstael late on the game. He's more powerful and important fot the plot than he seems. - Ardyn is not very commited to Niflheim (despite being the chancelor). He even allies with the main party for a while. He doesn't fight for any other cause than himself and his very high ambitions, but he's not a pure villain seeking for destruction and causing suffering like Cefca. That ambitions will doom him, also. - The world is very colorful until the second half of the game, when the stars stuff starts to happen. We could say that the game has 2 different "open worlds" depending of the moment of the plot we're playing. - Insomnia's citadel will be playable in flashbacks. Also, we'll visit it at the second half of the game. - "Chapter 0" is not related with Kingsglaive's events. - By now, only sidequests and technical aspects leave to be finished. We want the game to compete with The Witcher III in that aspect. - The definitive battle system will be an slightly improved version of Platinum demo's one. - Square-Enix is very satisfied about Shimomura's work in this entrance of the series. She could repeat on the next Final Fantasy. The 4 main characters sacrifice themselves at the ending of the game. The feeling is that they have made all that journey together, and they end it together. They transform into four ellemental crystals. Life goes on in Eos, everything is peace and harmony, and the world is no longer under menace. All things are in order now, but it's a bitersweet ending. All times are GMT +8. The time now is 05:33 PM.